Accelerate beat South Florida-stabled Gunnevera by a length in Saturday’s $6 million Breeders’ Cup Classic (Grade 1) at Churchill Downs in Louisville, Ky.
Thunder Snow, Yoshida and Mendelssohn finished third through fifth respectively in the 14-horse field. The race was 1 1/4 miles on dirt. Accelerate was the 7-2 favorite. He came into the BC Classic with a string of three straight wins in Grade 1 stakes at tracks in California. Gunnevera’s regular training base is Calder (aka Gulfstream Park West) in Miami Gardens, Fla. He is trained by Antonio Sano and owned by Margoth, whose principal Salvador Del Valle is a citizen of Venezuela. Gunnevera’s post-time odds were 30-1, even though his four-race record in 2018 included an allowance race win and a second place and third place finish in Grade 1 stakes. Odds on the third to fifth place finishers were 14-1, 14-1 and 13-1, That led to large payoffs, including $130.80 on the $1 exacta of 14-4 and $563.60 on the 50-cent Late Pick 5 and a whopping $171,748.95 on the 50-cent Super Hi 5. The winning order of finish on the race was 14-4-1-10-9. Multiple graded-stakes winner Gunnevera heads a Gulfstream Park contingent of almost 30 horses that on Wednesday were pre-entered in next weekend’s Breeders’ Cup races. Those races will be run on Friday Nov. 2 and Saturday Nov. 3 at Churchill Downs in Louisville, Ky.
Gunnevera, a 4-year-old colt that trains year-round at Calder in Miami Gardens, is among 19 horses that were entered in the $6 million Breeders’ Cup Classic (Grade 1). That race is 1 1/4 miles on dirt for 3-year-olds and up. It will be the final race on the Saturday Breeders’ Cup card, with scheduled post of 5:44 p.m. Eastern Daylight Time. A maximum of 14 horses will be allowed as entries in the BC Classic.Gunnevera is 16th on the points qualifying list. However, there is a strong prospect that Gunnevera will get off the bubble and into the BC Classic field. City of Light and Bravazo, two horses ahead of him on the eligibility list, also have been pre-entered for the Breeders’ Cup Dirt Mile (Grade 1). Their owners have listed that race as first preference. Meanwhile, one or more of the other horses in the top 14 could be withdrawn from consideration for the BC Classic. But he did not win any graded stakes this year, and that may be a reason for his relatively low ranking by the Breeders’ Cup panel of experts. The members of that panel are racing directors and racing secretaries at tracks in the United States and Canada. Later this weekend, we will have an article that reviews the Breeders’ Cup “who gets into a race” criteria. We also will look at Gunnevera’s chances if he gets into the BC Classic. The pre-entries are the final nominations for the BC races. Fields will be announced and post positions will be drawn between 4:00 p.m. and 8:00 p.m. on Monday Oct, 29. There will be five BC races on Friday Nov. 2 and nine BC races on Saturday Nov.3. The Friday races are all for 2-year-olds, and the Saturday races are all for 3-year-olds and up. Six horses that won stakes races at Gulfstream this year are pre–entered in BC races. *Promises Fulfilled — Dirt, Nov. 3, and Sprint, Nov. 3. In a news release, Gulfstream mentioned nineteen other horses that raced during its 2017-2018 championship meet and are pre-entered in Breeders’ Cup races. * Marley’s Freedom (Filly & Mare Sprint). Following Monday’s post position draw, we will have details on many of the horses listed above and on their prospects in Breeders’ Cup races. Editor’s Note — This article is the first in HorseracingFLA’s previews of the Breeders’ Cup races that will be run on Friday Nov. 2 and on Sunday Nov. 3 at Churchill Downs in Louisville, Ky.
Our coverage will be daily through Nov. 4 and will consist of articles written by our staff, articles picked up from other publications and edited news releases from race tracks and other racing organizations. A big part of our focus will be on horses that have raced at Gulfstream Park and/or at Tampa Bay Downs and horses with other Florida connections. Pre-entries were announced on Wednesday for the 2018 Breeders’ Cup races that will be run on Friday Nov. 2 and on Saturday Nov. 3 at Churchill Downs in Louisville, Ky. There will be five Breeders’ Cup races that Friday and nine Breeders’ Cup races that Saturday. The pre-entries are final nominations for Breeders’ Cup (BC) races. Fields will be set and post positions will be drawn on Monday Oct. 29 from 4:00 p.m. to 8:00 p.m. Eastern Daylight Time at an event In Louisville. In thirteen of the races, the maximum number of entrants is fourteen. In the Juvenile Turf Sprint, on the Friday card, the maximum is twelve entries. Twelve of the races are oversubscribed with pre-entries. *Seven entry spots are reserved for horses that won Breeders’ Cup Challenge races (usually about four per race) and for horses that had the most points in graded stakes races in 2018. There were 49 “Win and You’re In” Breeders’ Cup Challenge races in the United States or Canada and 33 such races in Europe. Forty-eight BC pre-entered horses won one or more Challenge races. *The other seven horses are chosen by a panel of experts, made up of racing directors and racing secretaries at tracks in the United States and Canada. Each race can have up to two Also Eligibles. There are 221 pre-entered horses. Twenty-five were cross-entered, in two races, with owners and trainers listing a first preference race. Thus, some horses that are not in the top 14 pre-entries will be able to get into a BC race. Post time on Saturday Nov. 3 is 5:44 p.m. Eastern for the $6 million Breeders’ Cup Classic (Grade 1) at 1- 1/4 miles on dirt for 3-year-olds and up. All of the Breeders’ Cup races will be televised live on either the NBCSports cable channel or on NBC’s network stations. All Breeders’ Cup races will be shown, with bets taken, on major Advance Deposit Wagering platforms–such as Twinspires, Xpressbet and TVG. On the two Breeders’ Cup days, Gulfstream Park and Tampa Bay Downs will both have full-card simulcasting of the BC races and other races from Churchill Downs. Gun Runner has been installed as the 9-5 morning line favorite and Arrogate is the 2-1 second choice for the $6 million Breeders’ Cup Classic (Grade 1), which will be run Saturday at Del Mar in Del Mar, Calif. Scheduled post time is 8:35 p.m. Eastern for the 1 1/4-mile dirt stakes for 3-year-olds and up. It is the 12th race on Saturday’s Del Mar card. Post positions were drawn on Monday evening, October 30th, with eleven entrants. Weights are 126 pounds for 4-YOs and up and 122 pounds for 3-YOs. Four entrants are 3-YOs. They are Churchill, West Coast, Gunnevera, and Pavel. Here is the schedule of events for the 2017 Breeders’ Cup races, to be run at the Del Mar Thoroughbred Club in Del Mar, Calif., on Friday Nov. 3 and Saturday Nov. 4. Wednesday, Oct. 25—Pre-entries for all 13 Breeders’ Cup races will be announced at 11:30 a.m. Eastern Time. Pre-entries are similar to nominations. A maximum of 14 horses can run in any Breeders’ Cup race. If there are more than 14 nominations for a race, criterion for “which horses get in” will start with earnings in graded stakes and continue with earnings in other stakes races and decisions by a selection committee. *Monday Oct. 30–Entries for all Breeders’ Cup races will be announced at 3:00 p.m. Eastern. *Saturday Nov. 4–The Breeders’ Cup Classic (Grade 1) has a scheduled post of 8:35 p.m. It is 11/4 miles on dirt for 4-YOs and up. It is one of nine Breeders’ Cup races on the Saturday card. We will have stories on the entries’ announcements and race previews, with a focus on horses that raced at Gulfstream Park and/or at Tampa Bay Downs. There will be four races on Nov.3 and nine races on Nov. 4. The last Nov. 4 race will be the 1- 1/4 mile Breeders’ Cup Classic (Grade 1). 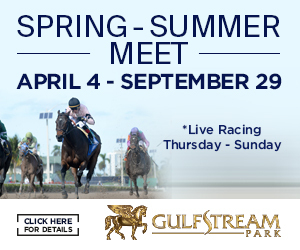 Our previews and race coverage will focus on horses that raced at Gulfstream and /or at Tampa Bay this year and on horses with other Florida connections. Prominent on our list is Gunnevera, this year’s winner of the 1- 1/16 mile Fountain of Youth (Grade 2) at Gulfstream and runner-up to West Coast in the 1-¼ mile Travers at Saratoga (Grade 1). Both races are for 3-year-olds. Gunnevera is trained by Antonio Sano, a South Florida resident whose year-round stable is at Calder. Sano is training Gunnevera toward the Breeders’ Cup Classic. Trainer Bob Baffert is pointing West Coast toward the Breeders’ Cup Classic or the Breeders’ Cup Dirt Mile (Grade 1), to be run on Nov. 3. The Breeders’ Cup Classic is scheduled to be the final race for the 4 year-old Arrogate, who is trained by Baffert. Arrogate won the 2016 Breeders’ Cup Classic at Santa Anita Park in Arcadia, Calif., and later won the Inaugural Pegasus World Cup.